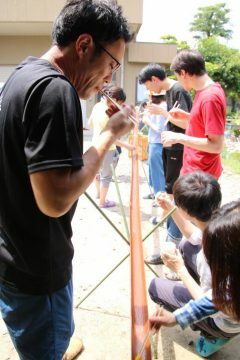 We had a rice planting event last Sunday with 15 people including 180 housemates and international friends from US, Germany. Rice planting is the act of transplanting rice seedlings from the seedbed to a rice paddy. In Japan, it usually takes place from around the end of April to late June. 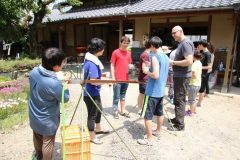 We enjoyed Japanese culture and also BBQ, Flowing somen.In nagashisomen, you have to catch flowing noodle by your own chopsticks. 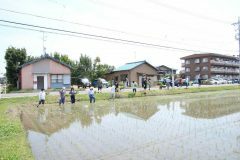 To me, it was the first time to experience both rice planting and Flowing somen. and I couldn’t expect this was that hard 🙂 This international party really succeeded !! I can’t wait for the next event ! !